Fiendish indeed! I am always open to new interpretations. Thanks! I have never found any cephalopods in the Edwards until this specimen, and cephalopods in the Edwards are generally quite rare and limited in diversity. As for belemnites, I am not aware of any reports of belemnites coming from the Edwards, or the Fredericksburg group to which it belongs, or any other lower Cretaceous formation in Texas. 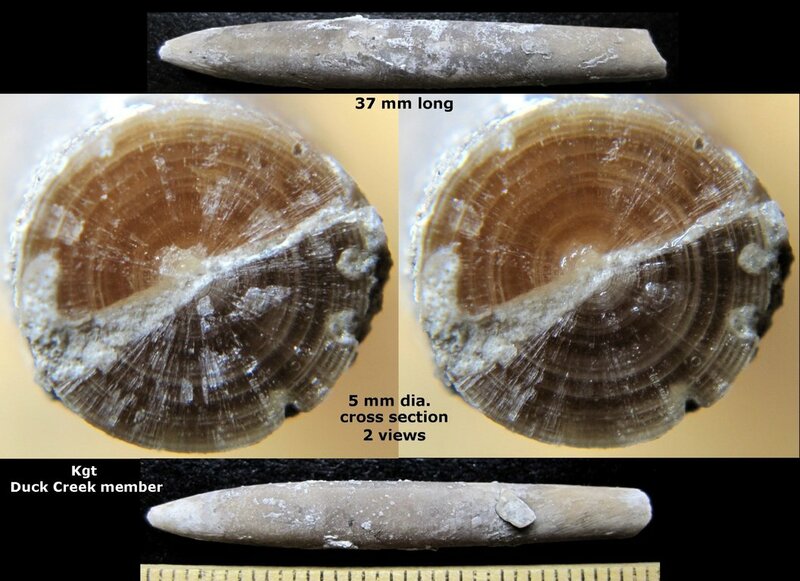 All of the belemnite occurrences that I know of in Texas are from upper Cretaceous deposits. In general, Texas is not the place to find belemnites. I’ve seen them from the Cenomanian and Albian of TX in other collections. Rare though. And the phragmocones are smaller diameter with faster taper than yours. I’ll try to remember to post that Campanian thing I found for comparison. Matt, I'm inclined to think your find is another variation on the countless rudists of that formation...similar to this one. I have seen a lot of rudists in my life, but none of them had this kind of preservation. They may have strange, almost aberrant forms like (for example) Coralliochama orcutti, and if we put in consideration the weathering facts, the result might be more unconcludent. Unfortunately, the specimen in question is just a fragment of the whole, with no clear celluloprismathic structure visible in the natural transverse section, fact leading me to think it might not be a rudist. I could be wrong, also. What of the lack of tubular structures in my specimen? For comparison, if my notes are correct, this is a Campanian echinoid burrow that I donated to the Mississippi Museum of Natural Science a couple years ago. Not saying with any certainty that this matches your specimen, but it does have some similarities. Since yours is a fragment, they could easily be eroded off. I've seen sections not displaying the tubular structures and shorter "chambers" within the same kind of rock. Note the linear striations on the outside of your specimen. They could be evidence of the tubular structures I'm sure you've seen within other rocks of that formation. Thanks! In that case, rudist seems to be the most logical ID. Didn’t know they could look like this, but I guess they can resemble lots of things. 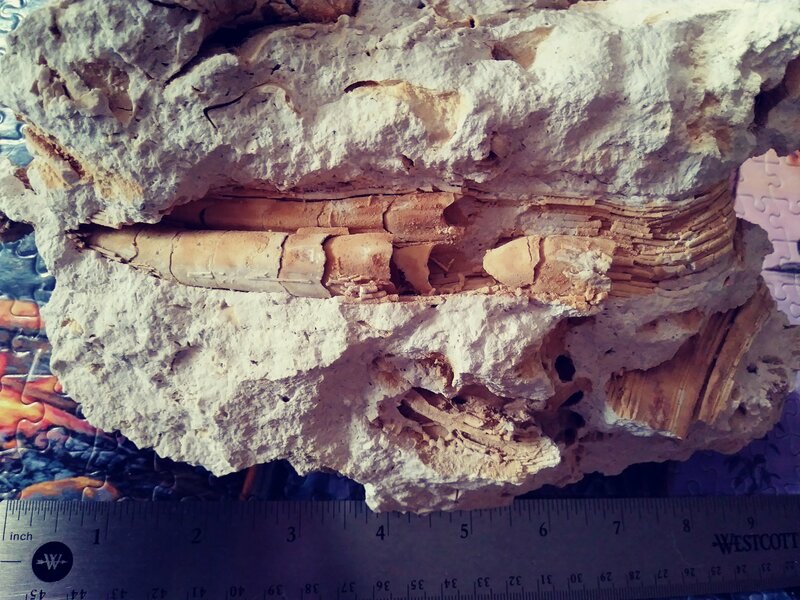 To your knowledge, have any belemnites been found in the Fredricksburg group or related groups? Thanks! Fascinating specimen. What formation? I found this belemnite-like specimen and a couple of other pieces in the lower part of the (Albian) Washita Group of Central Texas. That would be a Neohibolites sp., the only genus of "normal" belemnite that you get in the Albian - it's pretty much worldwide. I guess they're rare there? I've looked at a lot of Albian rocks in Texas...i was shocked and thrilled when I saw that one. Thanks for the lead on an ID, Tarquin. I believe the mistake was mine. Sometimes my lack of English skills is a problem to understand well some of TFF posts. I really understand quite well the “technical” English (just like I can understand French). My problem is with colloquial language… sometimes I lost something. Writing quickly is difficult also.